Luck, chance, and the comfy feel of the instrument's neck guided a young J Mascis to his first Fender Jazzmaster — and the rest is Dinosaur Jr. history. The band, which marks its 35th anniversary in 2019, has released 11 studio albums over four decades, and since 2007, they're back to the founding trio of Mascis, Lou Barlow, and Murph. Watching Mascis play live is exhilarating, even when you're certain that your eardrums might explode (it's worth it). A taciturn man, Mascis extracts a guitar's ferocious power with stoic and shaggy cool, treating it as an unruly comrade in arms. 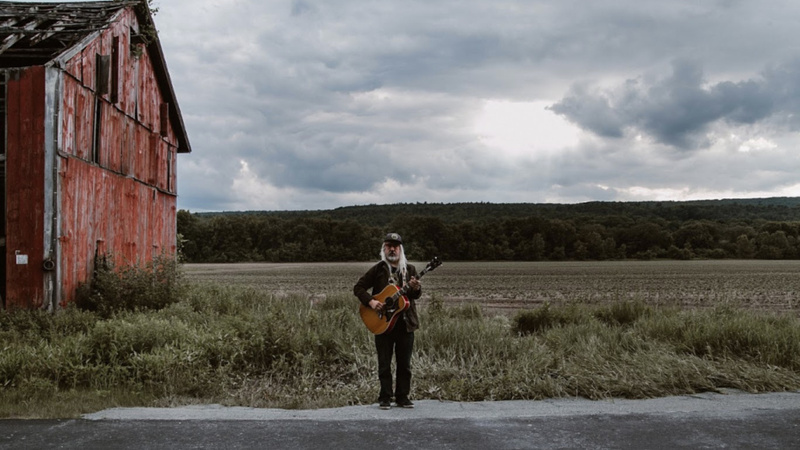 Any song with Mascis raging at its core might be very loud and amazingly raucous, immersed in feedback, but his music is frequently brushed with unexpected serenity too. That gentler side is evident on Mascis's forthcoming solo album, Elastic Days, released on November 9 on Sub Pop; his wistful, rasping drawl loping through regret-filled songs of love and life. Given Mascis's penchant for mighty blasts of grit — and beautiful semi-acoustic songs too, like the tender "Everything She Said" or the hazy chime of "See You At the Movies" from the new album — it's no surprise he always winds up on lists of the greatest guitarists of all time compiled by the likes of Spin and Rolling Stone. The accolades don't seem to either impress or faze him. Asking one of rock 'n' roll's most celebrated guitarists to write about another guitar god, Jimi Hendrix, is a dream pairing come true — and we were pretty darn thrilled to receive Mascis's choices of his "Five Essential Jimi Hendrix Songs" for FUV Essentials. The guitar sound is so heavy when it kicks in, it just bowled me over. That's my basic takeaway from this — how heavy a song can kick in, and how cool a guitar can sound. I heard Derek and the Dominos' version first and loved it. That was the first used record I ever bought. Then I realized that Hendrix wrote it and, of course, loved it. This version is so clean and pure. Best solo ever when it comes in, and he just holds that note. Then that cool drum fill comes and goes, but the note is still singing — then he just rips the most wailing s**t ever. It's just sick. From the movie. I never thought Hendrix's show was that good — out of tune, with a bunch of conga players, it seemed not his best idea— until the album came out and you realize the show was amazing. I've listened to it over and over. I love it and this song is killer. This should've been in the movie. More Woodstock jams; cool riffing that sticks in my head, year after year. Check out all of FUV's Five Essential Songs and Albums here.